The Red Masquers next stage production will feature a modernist Italian play that blurs the line between what is imaginary and what is real. 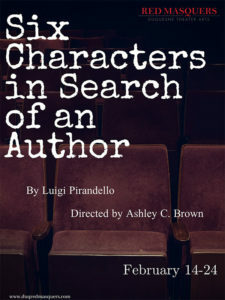 Six Characters in Search of an Author, written by Luigi Pirandello and directed by Duquesne senior Ashley C. Brown, begins when an acting company about to rehearse is interrupted by the arrival of six strangers who claim to be “unfinished characters” in search of an author to finish their story. Performances begin Thursday, Feb.14, and run through Sunday, Feb. 24. Thursday through Saturday performances begin at 8 p.m., and Sunday matinees begin at 2 p.m., in the Genesius Theater. Free tickets are available for all Duquesne faculty, staff and students with a Duquesne ID. Reserve your free Duquesne Affiliate Admission online now. Tickets are available to the public and can be purchased online for $16.50 for general admission, $11.50 for senior citizens and $6.50 for non-Duquesne students or at the door.